This is the fifth in a series of one-on-one interviews with City Council candidates, speaking for and about themselves. Sue Kempf brings a wealth of business experience and community service to her campaign for a seat on the City Council. Kempf, who moved to Laguna in 1999, became active in local affairs on top of two careers, separated by a period of consulting, that included a stint as Executive Director for Verizon’s four primary data center locations in the western United States. Skills honed during her business career at the highest levels in software development and systems infrastructures have served her well in her three terms on the city’s Planning Commission. “There is a nexus of skill sets that I bring that will be beneficial to the council,” said Kempf, who holds a master’s degree in business administration from Redlands University. “My skills are transferable between the private and public sectors. The ability to listen to others, to craft good solutions and temperament are attributes of particular importance. Kempf’s volunteer activities also include serving on the View Preservation Task Force, where emotions ran hot and high. She co-chaired the Disaster/Emergency Preparedness Committee after graduating from the first Community Emergency Response Team training class. CERT graduates are trained to conduct tasks that free up first responders for more grave efforts. “Safety is important,” said Kempf, who supports the proposed one-cent sales tax increase to fund undergrounding utility poles along Laguna Canyon Road. Kempf says not getting rattled is valuable quality for a council member. She is a listener, soft-spoken and calm even when confronted by rude behavior on issues such as the proposed Historic Preservation Ordinance, among the most rancorous hearings ever to come before the Planning Commission. Insults, boos and hoots by the audience ricocheted as factions presented their cases on whether the city should, by law, deem a structure a “historical resource” without the owner’s consent. “I haven’t talked to one person in favor of mandatory inclusion on the inventory,” said Kempf. The revised ordinance is due to be heard by the City Council on Sept 29 in a special, single-item agenda to give direction to the Historic Preservation Task Force. However Kempf’s top priority is the revitalization of the downtown, which also has consumed hours of debate before and by the Planning Commission, some of it highly critical of recommendations by consultants. “I like the idea of a downtown neighborhood as a way to bring economic vitality, community, culture and a pedestrian lifestyle,” said Kempf. “This includes housing for seniors, students and anyone who would like to live downtown. “The Orange County Business Council just released a study on the future of e-commerce and retail,” said Kempf. “No new retail centers are planned in Orange County. Instead, properties are being either repurposed as mixed use with retail on the ground floor and housing on upper floors or on building new centers designed as mixed use. 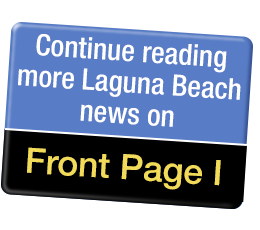 Also of concern: Complaints about Laguna’s homeless. “People tell me they don’t feel comfortable going to Main Beach,” said Kempf. “The issue of homelessness and how to address it is getting a lot of traction, particularly at the state and county levels. Responding to the question of how she would handle the homeless issue posed at the candidate forum hosted by the Laguna Board of Realtors and the Chamber of Commerce, Kempf said she would favor creating a housing trust to build permanent housing on county land. “There are 100-acre sites in the county that could be repurposed for housing,” she said. Asked at the forum what she would do about parking in Laguna, Kempf recommended more peripheral parking and increasing parking rates downtown until people won’t pay the price. She also opined that the Design Review Board is perceived to be an arbitrary process and is felt by many to be far too expensive even before calendared for a hearing. The city should look at what people are most upset about and fix it, Kempf said. With three seats open and only one incumbent running now that Mayor Pro Tem Rob Zur Schmiede has announced he is suspending his candidacy due to a family emergency, the complexion of the council could be drastically changed. “This is a consequential election and voters need to think carefully when they cast their vote,” said Kempf.